Well the Mets are done for the year so it’s time to move on. In my case, that means the Jets. I know that nobody expects the Jets to make the playoffs this year, but I do. I like the new coach. I like the new running backs. I like Vilma in the middle of the defense and I like Chad at the helm of the offense. 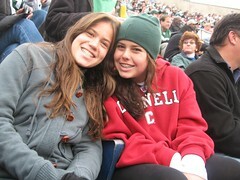 Most of all, I like being in the stands with other Jets fans cheering Gang Green on. Today it worked out great. Newer post GOOG – To Buy Or Not To Buy? Older post Do You Have To Go To Mecca?